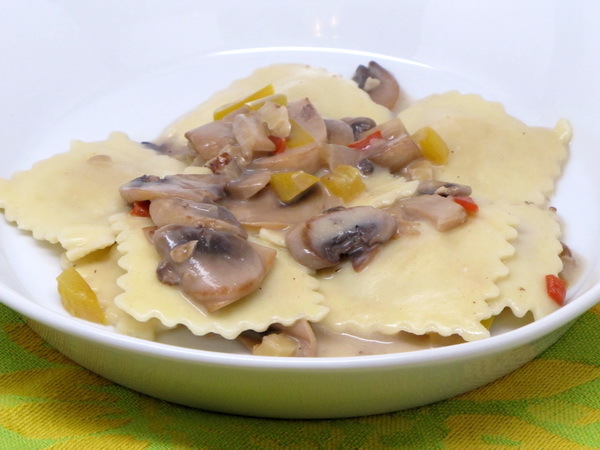 This dish has a great cream sauce that goes perfectly with the ravioli. I bet that the dish would be great with a mushroom ravioli substituted. 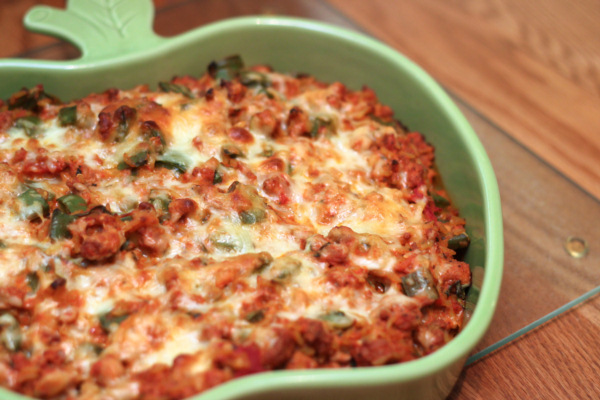 It’s a heavier dish, but certainly within the calories and sometimes you just gotta splurge ! Cook ravioli according to package instructions. Spray a skillet with Pam and cook mushrooms, shallot, nuts and peppers in oil until tender – add a little hot water if they start to dry out. Mix cornstarch, broth and half and half with the salt and pepper and then gradually stir into the pan. 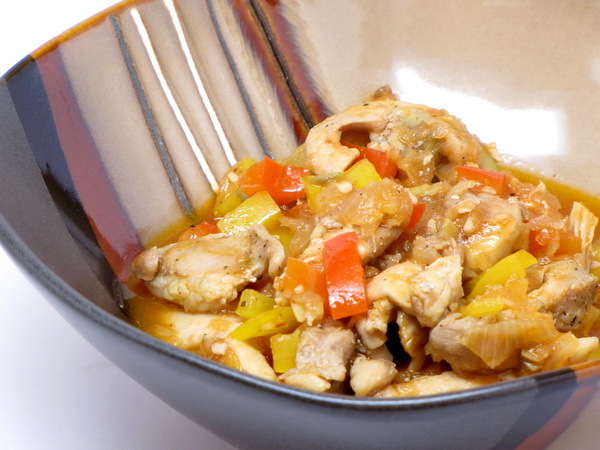 Bring to a boil and then reduce heat and cook 2 minutes or until sauce is thickened. Serve mixed with drained ravioli. Sprinkle with parmesan cheese. 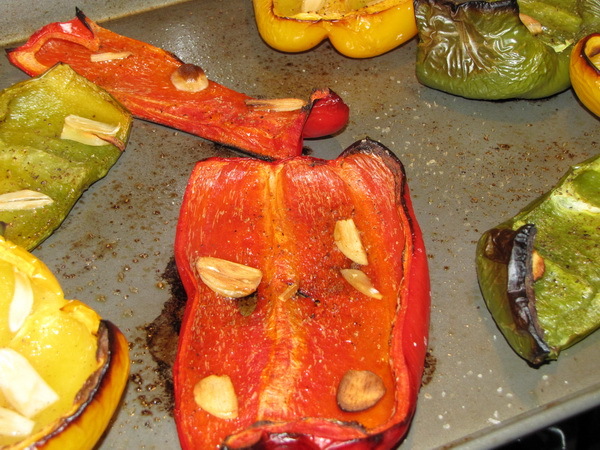 When you roast peppers, you make them ultimately sweet and bring out tons of natural flavor. When paired up with some simple oil, garlic, and seasoning, you get quite a treat ! Preheat oven to 450 degrees. Halve the peppers and remove the seeds. Place cut side up on a cookie sheet and drizzle with oil. 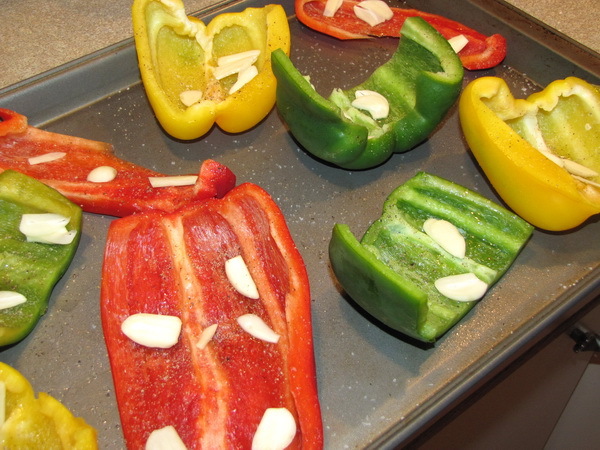 Add garlic slices to pepper halves along with oregano, salt and pepper. Roast 35 minutes or so (or until skin starts to blister) and then remove from oven and sprinkle with a handful of fresh torn basil leaves. 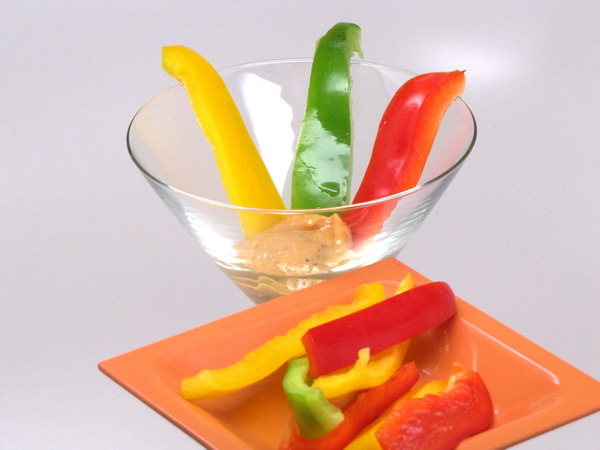 These make a great side to just about any dish. They are simple to put together, they cook up on no time and they disappear fast ! 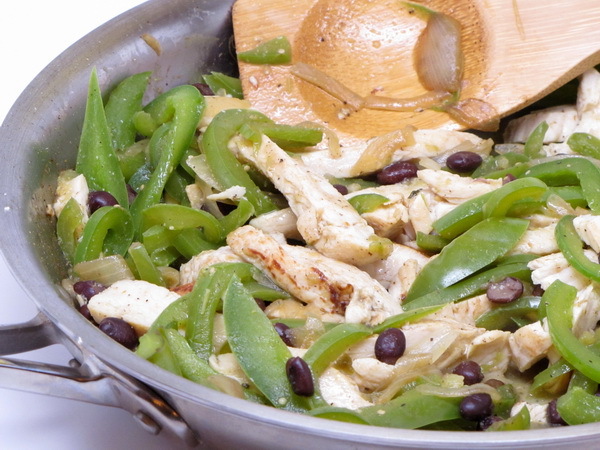 If you want to zest them up more, try adding some sauteed onions or garlic along with the peppers. Preheat oven to 400 degrees. Saute pepper in butter until tender and set aside. Mix flour, sugar, baking powder, basil, cayenne pepper, garlic powder and salt. 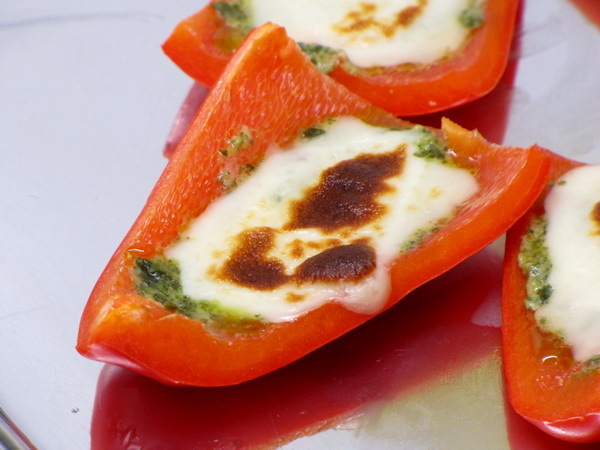 Mix egg and milk and stir into the dry ingredients until moist then fold in peppers. 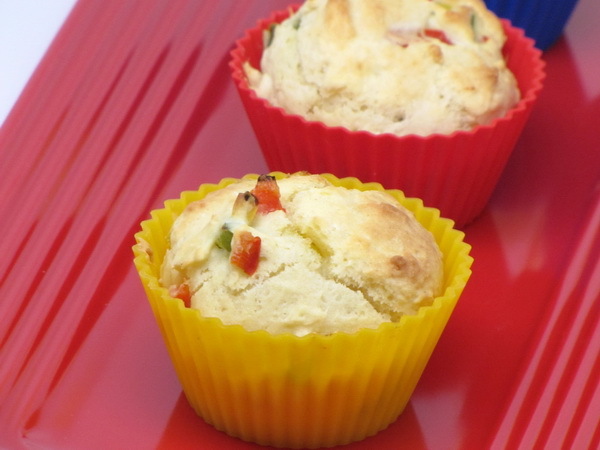 Spray muffin cups with Pam and fill 2/3 full then cook 15-18 minutes or until a toothpick comes out clean. Cool 5 minutes before removing from muffin cups. 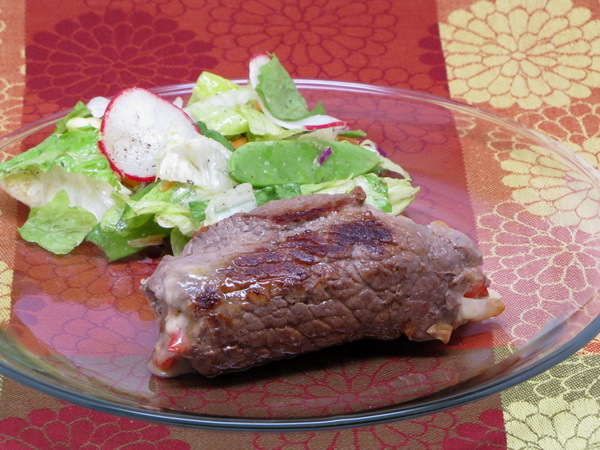 These beef rolls are like eating mini cheese steaks – so yummy ! Just look at the cheese dripping out the ends of the rolls ! Heat 1 T oil in a skillet on medium high heat and add onions, peppers and garlic. Saute 7-8 minutes and then add salt, pepper and 1/2 c water. Cover and lower heat and simmer 2 minutes or until dried out. Remove to a bowl and set aside. Season meat with salt and pepper. Put a piece of cheese and ¼ the onion mix into the center of a piece of meat. Roll up long ways and secure the seam with a toothpick or mini skewer woven in to keep the meat from opening while cooking. Heat a skillet to medium high and add 1 t oil. Place meat rolls in the pan and cook about 8 minutes browning all sides. Lower the heat if it browns to quickly as you want it to stay in the pan long enough for the cheese inside to get melty. Toss lettuce with vinegar and 1 t oil and season it with salt and pepper. Serve next to the beef rolls. 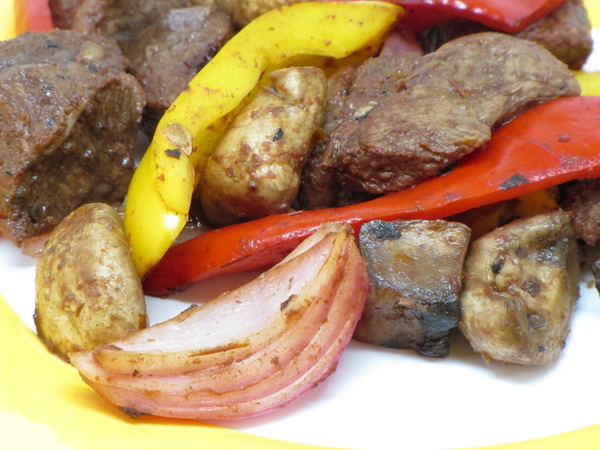 Remove toothpicks from beef before serving. Here is a video to help show you how to roll these up !